As usual our Thursday evening started with a discussion of where to go for dinner. It was a hard choice. “You have 3 options” Dad said, “American, Indian or Arabic food”. “No Indian food tonight” Mom said. I added “No Arabic too”, Dad laughed. “Why don’t we go to Awshal, the restaurant which I told you about?” Dad suggested and we agreed. We ordered seafood grill and bar-b-q. Altogether it was yummy. I wanted to end dinner with chocolate mousse as desert, but unfortunately it was not available today. In my last entry I wrote that I was going to beautify my hand. Yes, that’s exactly what I did. 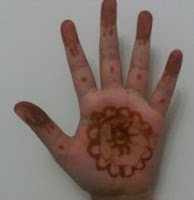 Last night I put on nail polish and mehndi on my palm. 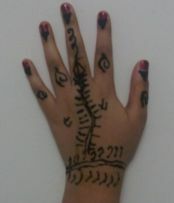 Today I did another design on the back of my hand. I must say, it is beautiful. Thank goodness for the computer. “If you eat cheese after every meal, it actually slows down tooth decay.” Pretty cool! The only problem is that Mom and Dad never buy cheese or even butter because they say it’s fatty. Not that the cheese is fat, but it contains a lot of fat. So, I guess sometimes Mom and Dad think that eating cheese for breakfast, lunch, tea and dinner is 8 times worse than fighting with a crocodile.